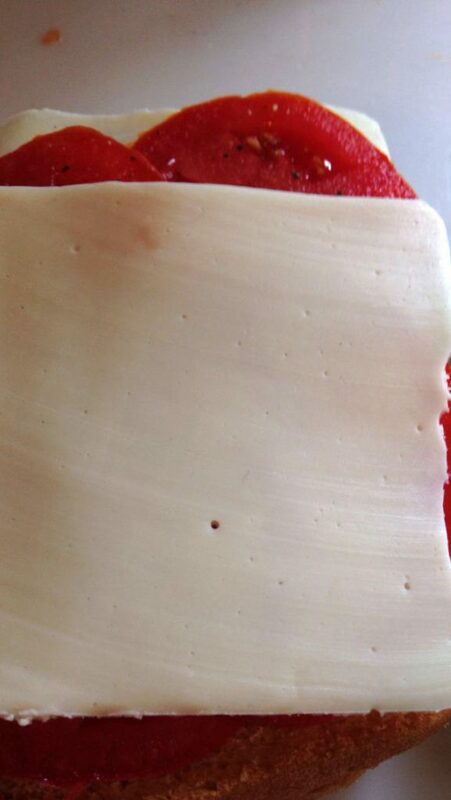 Erika Wassall, the Jersey Farm Scribe here with the truly Ultimate Grilled Cheese Recipe (with tomato!) This is such a simple, feel-good food. And with fresh tomatoes, it’s a sandwich that can’t be beat this time of year. However, avoiding soggy bread, flavor-lacking bites and no outside crunch can make it more of a challenge than it appears. You don’t just want a regular old grilled-cheese, you want the something special. This recipe will help you execute all the little details that will make the best grilled cheese sandwich around! So turn a simple grilled cheese into a high-crafted sandwich with a few very simple tricks using this grilled cheese recipe! First of all, good bread. I used potato bread, because… um, yum! But really, if you start with any good sandwich bread, you’re ahead of the curve. Give tomatoes a quick pat to dry them a bit. 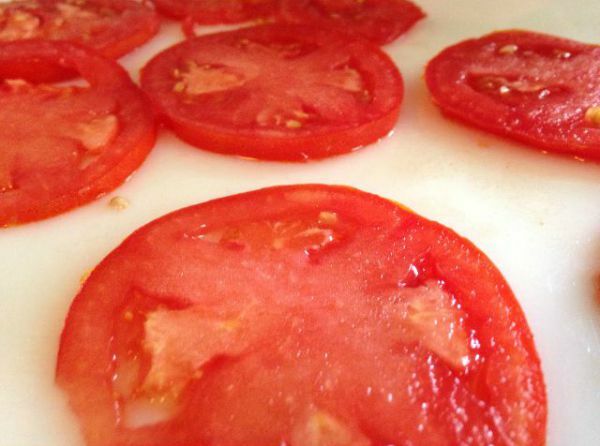 Cut the tomato slices thin, and then lay them out. Pat lightly with a paper towel to get off some of the excess water. Just a few pats. I use about 1-2 paper towels per sandwich. When putting it together, lay a piece of cheese down first, then the tomatoes (top with a bit of cracked pepper and just a DASH of salt for extra tomato flavor!) and then lay the second piece of cheese on top. It keeps the bread from getting soggy and it helps distribute the yummy cheesy-amazingness around the tomatoes nicely. So bread, cheese, tomato, (S&P), cheese, bread. Now, apply a VERY thin layer of mayo. I mean, just barely brush it on there. It grills up beautifully and deepens the flavor of the sandwich. And I don’t actually like mayo. It’s something I NEVER (EVER) put on cold sandwiches. But here, it’s a thing of beauty. I also light sprinkling just a touch of garlic power on top of the mayo, it’s a great option. Then put 1/2 TBS butter in the pan, over medium-low or low heat. 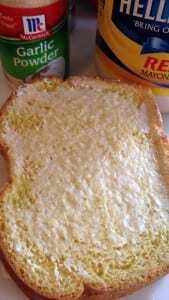 Melt the butter and then plop the sandwich in the pan (with about 1/2 TBS of butter already melted in pan), mayo side DOWN. Then you can do the thin layer of mayo to the other side. I’m not saying air tight, that’s no good. But lightly lay a piece of aluminum foil over the sandwiches, just to keep some of the heat in. You want to cook on LOW (maybe even simmer) so the cheese can melt and you can get that golden color. That’s it!! Follow those few tricks and you’ll end up serving up sandwiches that make people’s eyes light up. This is the type of sandwich memories are made of. Have the kids help you pick the tomatoes fresh from the garden and this grilled cheese recipe will have them begging to grow extras next year. Stack: bread, cheese, tomato, salt and pepper, cheese, bread. Brush lightly with mayo and sprinkle garlic powder. Cover loosely with aluminum foil and let cook on each side on low until medium brown and cheese is all the way melted. Serve the grilled cheese sandwich immediately. Devour. Enjoy! I love grilled cheese. This sounds amazing! I will definitely try that with my tomatoes! Grilled cheese is a definitely favorite here in our house! 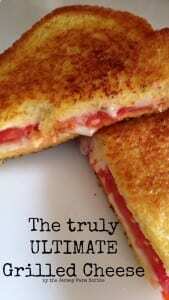 My hubby loves cheese and tomato grilled cheese sandwiches. I have never been much for them myself, but we do have them every once in a while since hubby loves them. This looks AMAZING! My husband loves grilled cheese, but only the traditional kind. So this would be a great step up for me to try! That sounds fantastic! I’ve never thought of using tomato in a grilled cheese before. Yum! That looks delicious! I was just thinking about making a different grilled cheese recipe lately, and this would be perfect! I usually do the normal grilled cheese, so this is definitely something different to try out. That is so boss! I’ve never thought of this before, but it makes sense. I love grilled cheese with tomato soup. My daughter loves tomatoes on her grilled cheese. I want to try the bread like this though! I am a huge fan of tomato and cheese sandwiches too! They are one of my favorite foods! I love a grilled cheese sandwich with sliced tomato and mozzarella cheese. Yummy! Mmmmm…I love mater sandwiches and I love grilled cheese sandwiches. I don’t know why I never thought to combine the two. I have to try this. This truly is the ultimate grilled cheese sandwich! I love tomatoes on anything..well just about! Yum! When I was little, my Dad would always eat toast and tomato sandwiches. I bet he would love this. I have not heard of using mayo instead of butter. This sounds delicious! I love making grill cheese sanwiches. I have never tried mayo on the bread but i have put a thin layer of mustard on the inside. That looks so yummy! 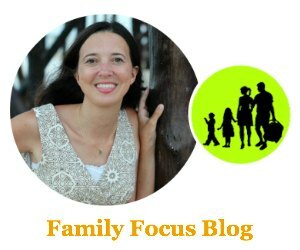 My kids love grilled cheese sandwiches so I will have to try this recipe and see if I can sneak in the tomato without them noticing. I’m going to have to try this for a quick meal. We love grilled cheese and this is an awesome update for the recipe. I love grilled cheese! Do you think this would work as well with cheddar cheese? Sorry for the delayed response! But sure, cheddar cheese would work if you enjoy the taste combination of cheddar and tomato. I love cheddar. Any meltable cheese will work, but with tomato, I prefer american, swiss or mozzarella, (occasionally I’ll toss a bit of feta in there too, but not on it’s own). We literally eat grilled cheese sandwiches like once a week in our home. Ill have to try this, thanks! Grilled cheese is a go to dinner item in our house. It would be nice to add a little more healthy to it. Yeah, now you’re talking! That’s indeed the best grilled cheese recipe. Now I want one! Simple, but delicious! This is indeed one of the best grilled cheese recipes. I love grilled cheese sandwhiches! i make mine occasionally with tomatoes too, so yummy! I absolutely love adding veggies in my grilled cheese sandwich. This looks awesome!